Laurel approaches the Arrow with information on Sebastian Blood, pointing to his possible connection to the man in the skull mask. Roy confides in Sin about his super-powered secret, but gets in over his head. 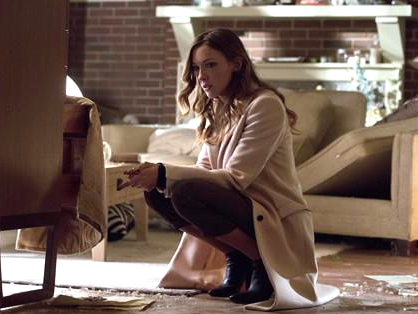 ARROW TEAMS UP WITH LAUREL TO FIND THE MAN IN THE MASK - Oliver (Stephen Amell) is conflicted after Laurel (Katie Cassidy) reaches out to the Arrow asking him to investigate Sebastian Blood (guest star Kevin Alejandro). Oliver is unsure whether to believe her accusations against the man he has publically supported for mayor, but decides to trust Laurel. However, when the pair gets too close to the truth, Sebastian exposes Laurel's drug addiction and has her arrested. Meanwhile, Roy (Colton Haynes) reveals his new super-strength to Sin (guest star Bex Taylor-Klaus) who wants to test out his abilities. Unfortunately, Roy isn't able to contain his rage once unleashed and almost kills a man. Back on the island, Oliver is surprised when Sarah (guest star Caity Lotz) reveals a secret about Laurel.